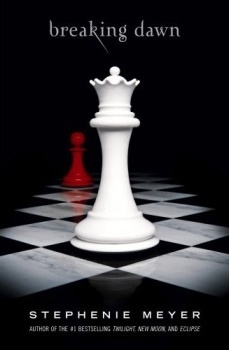 So, the last couple of days I’ve been reading the fourth book of the “Twilight” series called Breaking Dawn. The last 200 pages of the book were so exciting, but I didn’t want to read it because I didn’t want it to be over. It had a great ending, but I was mad that it was over. Later on that day I even got a fever blister because I was so stressed out that I finished. So, I decided I was going to go to the author’s official website. I found out that she did begin the fifth book of the series, but some people stole some of the pages of the book and posted it on a website when it wasn’t even done. So, Stephenie Meyer (the author) got so mad that she quit writing it. But now she started writing it again! She also posted the first chapter on the website! She also wrote another book called The Host. My mom said it’s not exciting. It’s also not about vampires. I was so excited that I read the first 20 pages of Midnight Sun, the fifth book. It’s a remake of the first book (Twilight) but from Edward’s point of view. I actually wanted her to continue with the story she left off with in the fourth book. But I will settle with it. If you want to read the first 20 pages of Midnight Sun go here. All of my friends are reading the “Twilight” series, and they all love it. It’s not what people think it’s going to be. Last year one of my friends was reading the series, and I was like, “You’re reading about vampires! Vampires aren’t real.” But it’s not like that. It’s really fun to read about, and she is a wonderful writer. I just hope that she will write a lot more books in the series. I just can’t wait until she finishes it! OK, Amber, first you and others convinced me I should read the Harry Potter books, which I haven’t done yet. Now you’ve got me convinced I should read the Twilight books! Maybe I’ll read all those books (a total of 12, I guess) someday. For now, I’m still struggling to get through My Name Is Red. I’m sure you’ve never heard of it because most people haven’t. It’s long and boring. Amber well done again girl! I am proud of you. I know you are on your break and not writing as much but you are really good at it honey. Keep up the good work! Tom, Yes the Twilight books are awesome! I read them first and encouraged Amber to read them because after reading Harry Potter she couldn’t find anything she liked. Amber really loved Harry Potter books! Hope you had a good holiday! Sounds good,Amber.Tom,why keep reading a boring book ,when there are so many exciting ones out there? Does this tell us you are stubborn or boring???? Thank you Amber for recommending such wonderful books! I love that genre and your choice is excellent! Happy New Year! I have yet to read the Twilight books, and I’m a huge “Vampire” fan (read: person who has watched Buffy & Angel). I’ve always been a bit worried that Twilight was more for the pre-teen/teen crowd, which is why I stay away from it. I can get a free sample of it on my kindle, so I might give it a shot…who knows. I did however read the Southern Vampire Mysteries (what “True Blood” on HBO is based off of). They were really good. My friend Jamie watches Angel and Buffy. But I haven’t really got into those. We watch Buffy sometimes when she comes to my house.